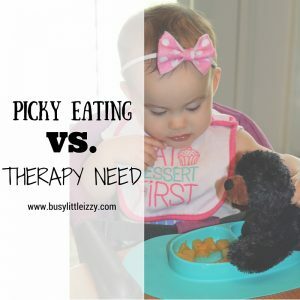 “My kid is just picky.” “He just doesn’t like that kind of food.” “My child can’t eat any foods with that texture.” We hear this a lot from parents but do you really know if your child is just being picky or may need some support from feeding therapy? Being a former special education teacher I spent a lot of time around students who needed support from a Speech and Language Pathologist, who would put a plan together so they would eat more than let’s just say potato chips or hot dogs. This may seem silly, but it’s serious. So help you all learn more about feeding I have interviewed a colleague of mine who is a Speech and Language Pathologist. She is giving great tips to support healthy eating habits and also telling you what signs to look for if your child may need some intervention with feeding. Amanda has her Bachelor’s degree from LSU, Masters Degree from Vanderbilt University. She is beginning her 14th year as a Speech-Language Pathologist. Amanda worked in the public schools for 10 years, in a variety of roles, including 3 years on the Fulton County feeding teams serving a large part of the Atlanta Metro area. She has also worked as a private therapist since 2004; traveling for the first 8 years. After that, she opened her own clinic in 2012. Amanda has worked with kids with feeding difficulties from ages 6 months through high school age. 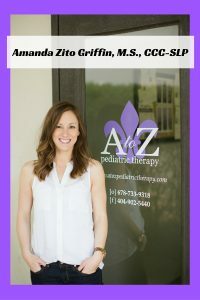 Additional Certifications/Trainings: Owner and Director of A to Z Pediatric Therapy. Trained in SOS Approach to Feeding – both basic and advanced courses (2012). Trained in Beckman Oral-Motor Protocol (2005). Trained in PROMPT Level 1 (in 2006 and again in 2016). Amanda, what do you think is the best way to prevent picky eating? Exposure, variety, and family mealtimes. As parents, we get incredibly busy and are always trying to multi-task and fit everything in. This typically involves making a meal for our kids and having them eat while we do other things around the house. We rarely sit together and enjoy a meal as a family. Also, parents have become short-order cooks. We fix what is fast and easy and what we know our kids will eat. So we all get into a cycle of buying the same foods, fixing the same meals, and avoiding a fight. A lot of times parents think they just have a picky eater and although they really may, what are the signs we need to look for if this may not just be the case? The difference between a picky eater and a child with a true feeding difficulty is sometimes hard to distinguish. We look for a number of red flags. These “red flags” often occur throughout infancy and toddlerhood as a natural course of development. However, when some of these red flags continue and persist, feeding intervention may be necessary. There are obvious red flags like poor weight gain; consistent weight loss; a history of GI issues (including reflux or constipation); choking/gagging/coughing during meals; and/or difficulty transitioning from liquids to solids. Other, more subtle, signs are omitting entire food groups or all foods of a certain texture; extreme behaviors during mealtimes (e.g screaming, hitting, kicking, throwing things); only eating when distracted by TV or a device; or having a limited diet (less than 20-30 foods). If we see these signs, what’s the first step, an evaluation? If you suspect feeding difficulties, we would always recommend starting with a conversation with your child’s doctor. Typically your pediatrician or a specialist such as a gastroenterologist (GI). We always want to rule out any medical conditions. At our clinic, we always speak with a child’s parent/caregiver first to get an idea of what is happening currently, a child’s history, and what challenges the family is experiencing. Most of the time, if we have gotten to that point, an evaluation will be warranted. At our practice, we meet with the child and his/her parents for quite a while to observe typical mealtime behaviors and routines, attitudes towards meals, response to strategies. We also evaluate all aspects of feeding during our assessment: oral-motor, sensory, behavior, and any other psychological factors. What can a parent/child expect during a feeding therapy session? There are several different approaches to feeding therapy out there. Some are based solely on behavior modification techniques. At our clinic, we follow the SOS Approach to Feeding but also pull from several other approaches that focus on the whole child (looking at oral-motor difficulties, sensory challenges, behaviors, anxiety related to meals, family dynamic, etc.). Our approach incorporates positive reinforcement, systematic desensitization, food chaining, and behavior modification techniques. Our overall focus is on building positive associations with foods; developing trust between clinician, child, and caregiver; and making mealtimes fun. Our work is to build and expand on what a child already has in his/her diet. For younger kids, the focus is exploration through play. For our older kids, we use a cognitive based approach: discussing and examining the properties of foods through our senses. Most of our therapy is done in individual sessions with a child and his/her parent or caregiver. We all work together on meal setup and exploring foods together, targeting a variety of different foods. We incorporate different food textures and foods from a variety of food groups during one session. We investigate foods together, step by step up a hierarchy, working on developing positive experiences with foods and allowing the child success in his/her interactions with the food. Along the way, we coach the parent or caregiver, helping them to incorporate the same techniques and vocabulary into their own mealtime routines at home. At a certain point, when a child is doing incredibly well in our clinic, we see if we are able to move the focus to generalization outside – at home, school, and/or in a restaurant. At our practice, we will begin also offering group feeding therapy sessions. In these groups, “peer pressure” works in our favor, as children work together with one another and a speech-language pathologist. While this is happening, parents/caregivers meet separately with another therapist to receive education, observe techniques being used, problem solve with one another, and give one another support in this process. The focus of the group, again, is building positive interactions with food and making mealtimes fun and social. How long may a child be in feeding therapy? A few weeks, months, years? There’s no easy answer for this, as with any type of therapy. Typically, children are in therapy for at least 6-12 months, but may require more. There are multiple factors that contribute to a child’s progress and carryover outside of therapy. Some of these include a child’s age; any additional medical or physical issues a child may have; sensory processing issues; oral-motor deficits; and other associated deficits (e.g. cognitive delays, language impairments). Family participation and involvement, though, is one of the key factors to success. This almost always direct impacts the length of therapy. At the end of the day, success in feeding therapy depends on the entire family making changes – in their attitudes about food, the langauge they use, ability and willingness to incorporate strategies into the home, etc. This makes or breaks what is done in feeding therapy, at the end of the day. We do typically see more progress when a child begins feeding therapy at a younger age. As a child’s gets older, it becomes more difficult (but definitely not impossible!) to make these changes. Sometimes, it’s simple math. Meaning, if a child experiences pain, discomfort, anxiety at each meal…3-5 meals a day, 7 days a week, 12 months a year…it’s unavoidable that they will develop negative associations with foods. These associations are reinforced every day and it becomes a vicious cycle. Therapy can work to change these associations and behaviors, from negative to positive. But it does not happen overnight and takes hard work, as most things do. At home tips, or do/do nots of feeding therapy? Parents first must examine their own behaviors and attitudes regarding meals and food. Do they make an effort to sit down with their kids? Do they expose their child to lots of different foods, even ones that others in the family may not like? It’s so easy to fall into a cycle of quick meals, on the go, with the same things day in and day out. I struggle with it myself daily, as a parent of two kids under 4 years of age! We have to make time for family meals. We need to expose our kids to new foods constantly, and do it over and over and over again. We need to make positive associations with foods. Please avoid force feeding your kids and/or distracting them with devices or screens to get them to eat. Involve them in meal prep and routines around meals. Play with food! Make sure your child is posturally supported when s/he is eating: seated upright and with support under their feet. Is there any other information you feel is relevant and important for us to know? Making changes, ones that are positive and that last long-term. They don’t happen overnight but it is possible. It’s easy to be lured into a quick fix, but be patient and positive, and changes will happen! As a parent you want to do what is right for your child, whatever you feel that is. As parents and humans we all feel different things are right and that’s okay. But sometimes we just don’t have the facts to help our kids the best way possible. Feeding can be tricky and a lot of us have made mistakes with this tough area. But that is okay, now you have a new knowledge base to build from so take this information and share it with others so they can learn as well. A lot of great information Eryka!! Thanks for sharing! Yay enjoy and pass on to your friends! So interesting and so many great things to think about! This is such a great read Eryka, thank you so much for sharing!! My husband is honestly the worst eater in the history of humanity (he truly doesn’t eat fruits or vegetables it’s terrifying) so I am on constant high alert regarding Reef and trying to ensure he doesn’t pick up his dad’s poor eating habits!!! I am guilty of making the same things over and over…quick and easy meals around here a lot. Going to need to change it up a bit. Thanks for the info! Great information! I have to honestly say that anytime I ever saw a child refusing food I just assumed they were being picky and/or just didn’t want to eat it. I really loved this a lot! I do tend to hear these things often as well and have actually been guilty of saying it myself. Thanks for all the info! This is a subject that really does need to be talked about more. Since we have gone through so much grief this past summer in losing Little Miss, Tera has gone through a stage that she has a hard time eating. I truly believe that it’s because how our children eat is all mixed up in their feelings. So interesting! Great advice! My son is a picky eater, but I don’t think he is at the point where food therapy is required. This is great information! So many moms don’t know how to identify if their child is just a picky eater!